An updated edition of the parenting classic Have you ever thought: 'I can't believe I just said to my child the very thing my parents used to say to me! Am I destined to repeat the mistakes of my parents?' 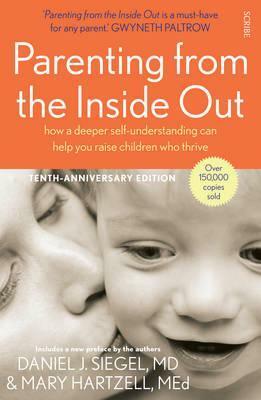 In Parenting from the Inside Out, child psychiatrist Daniel J. Siegel and early-childhood expert Mary Hartzell explore how our childhood experiences shape the way we parent. Drawing on stunning new findings in neurobiology and attachment research, they explain how interpersonal relationships affect the development of the brain, and offer a step-by-step approach to forming a deeper understanding of our life stories, which will help us raise compassionate and resilient children. Combining Siegel's cutting-edge neuroscience research with Hartzell's 30 years of experience as a child-development specialist and parent educator, Parenting from the Inside Out guides us through creating the necessary foundations for secure and loving relationships with our children. This tenth-anniversary edition includes a new preface by the authors and incorporates the latest research from the field. Daniel J. Siegel, MD, received his medical degree from Harvard University and completed his postgraduate medical education at UCLA, where he is currently a clinical professor. He is the executive director of the Mindsight Institute, and the author of numerous books, including the acclaimed bestsellers Mindsight: change your brain and your life and The Whole-Brain Child (co-authored with Tina Payne Bryson). He lives in Los Angeles with his wife and occasionally with his launched adolescents. Mary Hartzell, MEd, received her master's degree in early-childhood education and psychology from UCLA, and is a child-development specialist and parent educator. She has taught children, parents, and teachers for more than 30 years, and has been the director of a highly respected Reggio-inspired preschool in Santa Monica, California. Her parent-education classes and CD series on parent-child relationships have improved the lives of children and their families for decades.